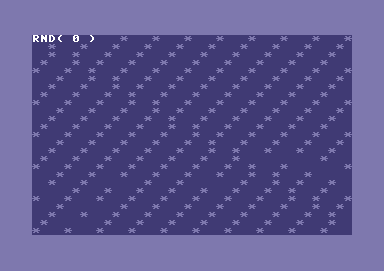 Remark: This article describes the BASIC-Command RND in BASIC V2 at the Commodore 64. The function RND generates random floating point numbers in the range of 0.0 (inclusive) to 1.0 (exclusive). The argument <number> can be positive, negative or zero. By using RND(<positive number>) gives a different random number each time from a predetermined sequence (the sequence number is stored internally). Using RND(<negative number>) jumps to a point in the sequence determined by the particular negative number used. Repeatedly calling RND with the same negative number results in the same result; typical use is to call RND(<negative number>) once and then repeatedly call RND(<positive number>). 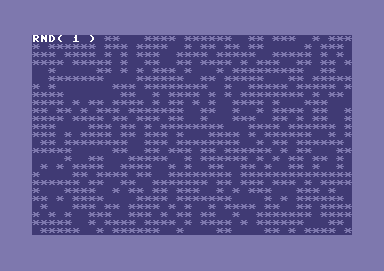 With RND(0) the C64 generates the random number from the internal clock, though the possible values are limited as the digits of the clock only fall in the range 0-60, so it is not suitable for generating large ranges. By using a invalid numeric value the BASIC error ?TYPE MISMATCH ERROR appears. When the numeric argument is absent, it appears as ?SYNTAX ERROR. Using the real-time clock for initialising the RND-function. 10 REM THIS PROGRAM SHOWS THE DIFFERENCE BETWEEN RND(0) AND RND(1). 30 REM AFTER THIS HAS FINISHED PRESS ANY KEY TO START RND(1). With RND(0) you see a pattern. This is because RND(0) can only generate 256 numbers. For filling out the screen with asterisks (*) you need 1000 characters, but do note that this code does not look whether a spot is filled with an asterisk or not, so it may write an asterisk where there was already one, making it look like fewer asterisks were written. This page was last modified on 24 October 2018, at 15:50.